There have been many versions of Pere Ubu over the years, but this is something like the version that I saw in 93. In related memories, there was the time I saw Pere Ubu at Slim’s in San Francisco in 1993. The common thread here is legendary Cleveland underground band Rocket from the Tombs. After a brief but influential tenure in the mid-70s, which produced a few singles and many live performances but no actual album, RFTT splintered into two factions. One became the Dead Boys, featuring Stiv Bator, later of Lords of the New Church. 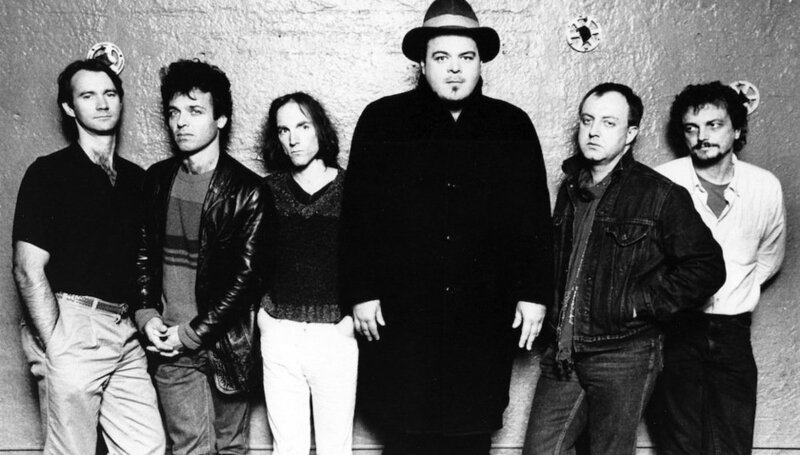 The other, including David Thomas – known as Crocus Behemoth during his time with RFTT – and the soon-to-be late Peter Laughner, became Pere Ubu. Ubu recorded a number of strange and innovative albums in the late 70s and early 80s, and in the late 80s returned in a somewhat more accessible form. I was not really aware of them until I saw them open for the Pixies at the Warfield in 1991, but when they came around again in support of 1993’s The Story of My Life, I was right there at the foot of the stage. They opened with the first song from Story of My Life, “Wasted,” a slow-moving number that starts with just voice and accordion. But a minute or so in they stopped. David Thomas indicated, quite clearly, his displeasure with the way the accordion sounded; there was a pause in the action. This gave those of us in the audience reason for worry. Thomas is a large, intimidating-looking man with a bizarre singing voice and overpowering stage presence. He is also known as a prickly personality who does not suffer fools gladly. If things got off on the wrong foot, chances were it was going to be a long night (or perhaps an abnormally short one, if Thomas lost his temper and stormed off stage). After an interval of technical consultation they started again, and after a nervous minute it became apparent that they were going to make it this time. There’s a moment about 90 seconds into “Wasted” where the band kicks in, and when they got there, it was like a massive “whoosh” and a blast of wind coming off the stage. Just fantastic. We had barely recovered when they kicked into “Oh Catherine,” which starts with two chiming guitar notes followed by a thundering bassline that blew our hair back all over again. And lo and behold, the great man approached me. I asked for “Non-Alignment Pact,” the first song from their first album, The Modern Dance, and I do believe he cracked a grin. He went to confer with the band, as “Non-Alignment Pact” requires an unusual tuning, but after a minute they decided they could do it. Today’s assignment: Watch this fairly random mash-up of Pere Ubu and the old Batman TV show, and when the guitars hit at around 1:05, try to imagine my joy when that very noise hit my ears 22 years ago. It’s a bit of a challenge, but I bet you can do it. This entry was posted	on Monday, October 26th, 2015 at 7:40 pm	and is filed under Dancing about architecture. You can follow any responses to this entry through the RSS 2.0 feed. You can leave a response, or trackback from your own site.